It is very easy for an organisation such as ours to be seen to be making objections and complaints but it is important to make comments on things that have been done well. It is also important to encourage others undertaking similar restoration or improvement work to reach for the highest standards. This award will be made in recognition of outstanding improvements to, or conservation of, Hadleighs buildings or environment. It will be an individual framed commendation. The award will not necessarily be made each year, but there may be more than one award in a year. Nominations are invited from members with a closing deadline of 1st January, the nominations will be considered by the Executive Committee, if necessary with the benefit of appropriate expert advice, and any awards will be made at the Societys AGM. Nominations for the award should include written comments and reasons for the nomination together with supporting evidence and should be sent to the Chairman, Hadleigh Society to arrive before the above closing date. In response to that first notice several nominations were received, relating to three Hadleigh properties. At the 1989 AGM the first Hadleigh Society Award was presented. to Mr. Keith Young on behalf of 'Edwards of Hadleigh' in recognition of the skill and care shown in the renovation of their High Street premises. At the 1990 AGM it was proposed by John Bloomfield and seconded by Ben Allen that the Societys award in recognition for Outstanding improvements to, or conservation of, Hadleighs buildings or environment, considered annually, shall in future be known as The Hadleigh Society Noel Turner Award. Noel Turner, FRICS died on the 23 Aug 1990, aged 72. The logo now used for the award represents the gavel which Noel presented to the society for use by the chairman at meetings. the first Noel Turner Awards were announced, three in all. This former mediaeval building had already been altered to form two large areas fronting the street, with single storey extensions to the rear before being refurbished to serve as a gallery for the sale of antiques. The single storey rear extension has been opened into the front spaces by the simple device of wide arched openings. The whole effect is to create a large open gallery with three partially defined areas. This award is made to recognise the high quality of the work done and of the pioneering spirit in establishing a standard for future refurbishment of the South end of the High Street. for conversion of adjoining stables and outbuildings. A range of single storey stables and outbuildings has been converted to provide two disabled bedrooms with en-suite bathroom provision and a third central bedroom with shower, to provide for an accompanying companion/ nurse. The whole is arranged to allow flexibility in particular letting arrangements for disabled visitors to this small hotel. Ramped access is provided; and wide openings formed, suitable for wheel chair use. The sanitary provision is fully equipped with grab rails and other aids conforming with recommendations for disabled use. This award is made to this unassuming remodelling in recognition of the provision made for the disabled. A two storey extension has been added to the rear of the existing building providing recessed parking space on the South side and two storey offices around and above. The extension is carefully grafted onto the existing building so as to avoid alteration to the existing gable and old tiling but still maintaining the form and pitch in the new extension. The extension has been rendered and the scale is entirely appropriate to the adjoining buildings. On the other side of the building modest, but careful landscaping has provided additional parking nd turning space with pedestrian access to the rear of the offices. This North facade is linked to the existing building by a glazed semi circular roofed link lighthearted in spirit and entirely appropriate to the forward looking nature of the Consulting Engineers whose office this is. to Mr Barritt, the local Engineer for the National Rivers Authority Anglian Region. Mr Ripton, the District Engineer, gave a presentation on the background to its introduction and working. Two awards were presented at the AGM. Mr and Mrs Peter Jarvis acquired a potentially difficult site for construction within a conservation area in the town of Hadleigh. It was particularly important for the dwelling to be built to harmonise with the variety of local styles adjacent to the proposed building without copying them and produce a design which would sit comfortably amongst these as it mellowed. Moreover the problem of creating a building which would not appear to be out of character whilst providing amenities appropriate to the twenty-first century provided a considerable challenge. The Old Lodging House is of much credit to the present owners, whilst the choice of name perpetuates a part of Hadleighs history which might easily have been forgotten. Mr Ian Newman of East Anglian Renovations saw the sites potential for meeting the needs of the community, in a singularly imaginative way. 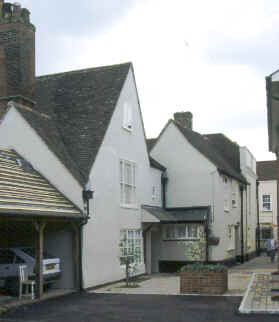 By the creation of private accommodation within the historic structure, whilst retaining many of its original features and moreover by designing mews housing to the rear, the site was retained as a single development greatly in character with this part of the town, at the same time as providing a structural link within the Towns core. 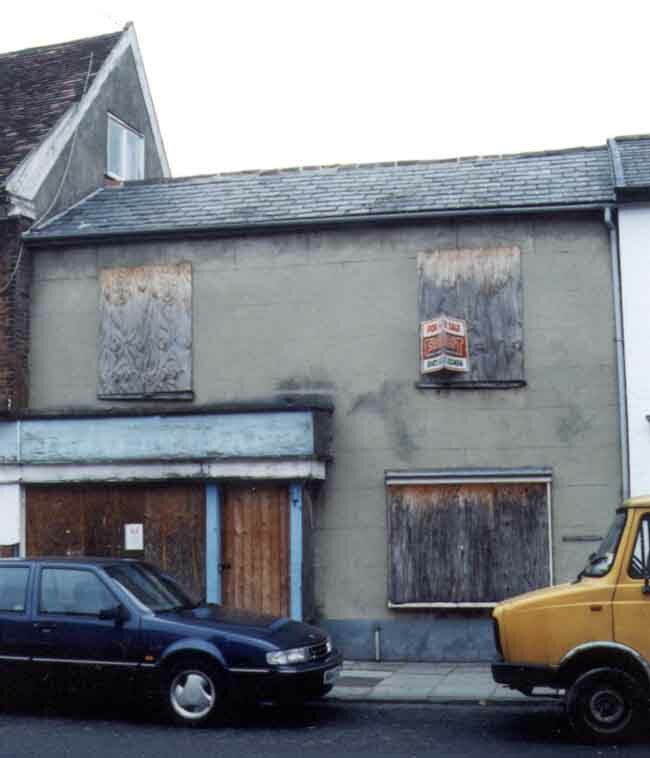 No 100 High Street Hadleigh, Suffolk, has long been an eyesore in the conservation area of the town. It was last used as a shoe shop and was still packed with items from this period. The building, which contributes considerably to the street’s appearance, had been allowed to deteriorate to the point of near collapse. Part of the original shop extended into the building to the North and a complicated pattern of subdivision of the two adjacent properties had evolved. Mrs. King and Mr. Hipkin resolved the boundary issues and commenced repair of the building, whilst retaining the features of its development from its original construction. 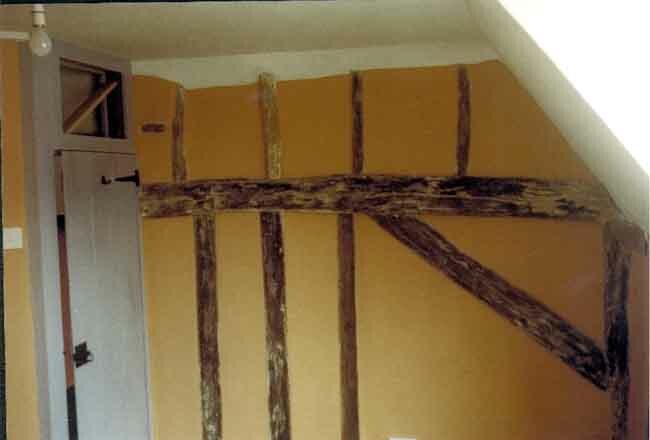 What was discovered under the many layers of evolution was a 15th century medieval hall to which a large hearth had been added in the 17th century. In the 18th Century the building had been refronted, possibly at the time it was made into a shop. The recent restoration has created a compact dwelling of considerable charm having all modem facilities and which does much to enhance the appearance of the Northern part of the High Street. By their low key but effective approach to the project, which in other hands could have easily suffered from over restoration or loss of character, Mrs. King and Mr. Hipkin are to be roundly congratulated. The derelict maltings on the site have been sympath�etically converted and the character of the Station has been carefully retained. There were two awards made at the AGM, presented by Jan Byrne. 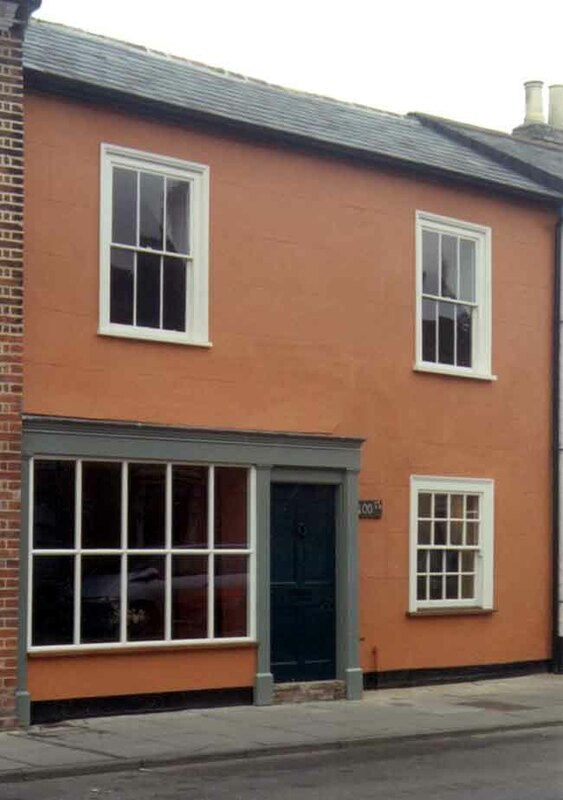 Clare Vint, Conservation and Design Officer at Babergh District Council, received the award for progressing a practical pavement scheme on the northwest side of the High Street, which emphasised the group value of listed buildings within the Hadleigh Conservation Area. The Ipswich and Norwich Co-Operative Society was nominated for the sensitive design of its supermarket extension and pedestrian link, whilst retaining the character of the High Street frontage.